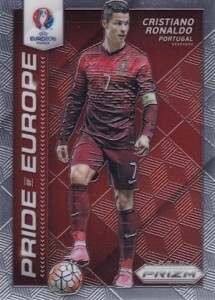 2016 Panini Prizm Euro Soccer looks at the 2016 UEFA European Championship with a comprehensive release. 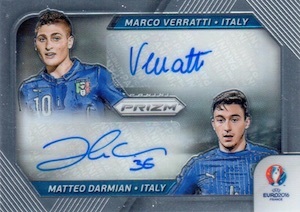 Hobby boxes promise multiple inserts and Prizm parallels as well as one autograph or limited parallel. 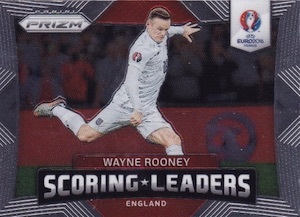 Built around a 250-card base set, the release basically follows the format established in the widely popular 2014 Prizm World Cup. 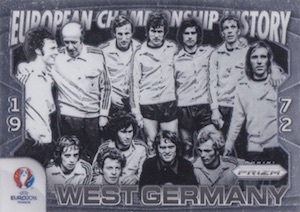 Each of the 24 national teams are covered with at least ten players. Adding to that, collectors can find several different Prizm parallels, including Flash (1:24 packs), White (case hit) and Black (1/1). 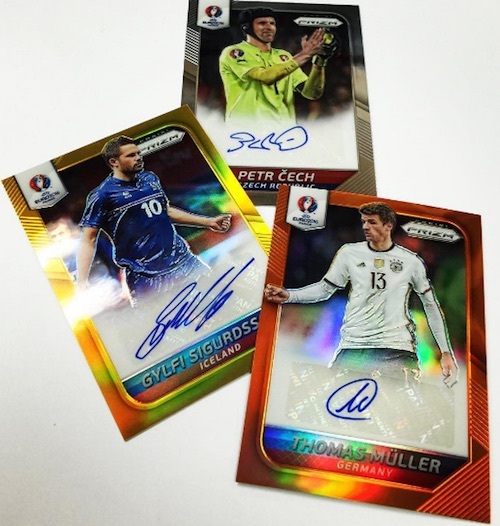 Likely to command the most attention, single-player Autographs are available as well as Dual and Triple Autographs. A full checklist is not yet available, but tentative names include Harry Kane (England), Gianluigi Buffon (Italy), Andres Iniesta (Spain), and Gareth Bale (Wales). In addition, there are several inserts to track down. 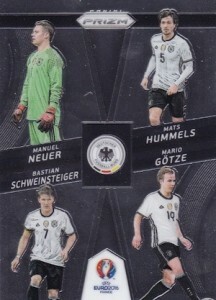 This includes 32 Stars of the Midfield, 24 Keepers, and ten Pride of Europe inserts that are a case hit. 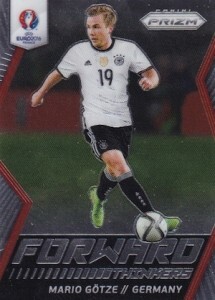 The 2016 UEFA Euro is scheduled take place in June and July of 2016 and features the top national soccer teams in all of Europe. 38 cards. 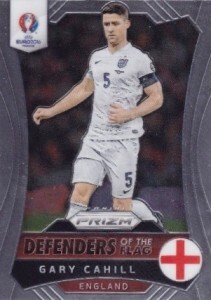 Card #28 (Cazorla) not found in Orange/Gold parallels. 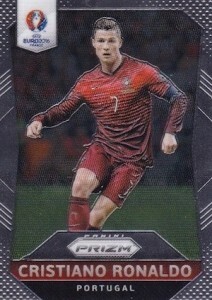 1 Prizm Parallel #/5 or 1/1 per case? Brad � Updated distributor info. So that calculates out to about 3500 cases made if my math is correct. Needed a smaller checklist. Too many “Who? !” cards in this stuff. I did pull a nice Green #/5 AND an auto in the same box. Surprised me. 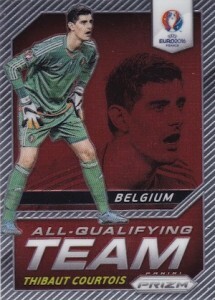 Overall, a bit too expensive if you dont get an auto. 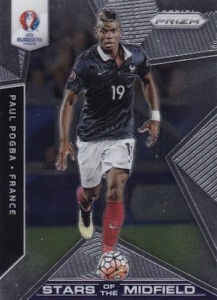 too little surprise when u r breaking the box, especially we u pulled out the auto or /20 too early. Too many “whos”? 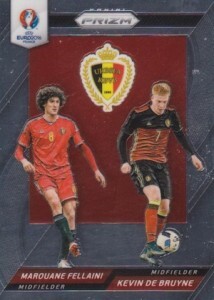 Don’t collectors from the countries with the “whos” deserve to find some of their cards. 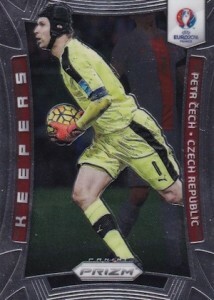 Champions League set had cards of Malmo players. Whos??? 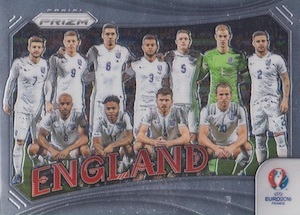 I sold some cards to a guy from Sweden who was over the moon for the chance to purchase those cards. This looks like a very nice set. Thanks for the info. Going crazy right now. 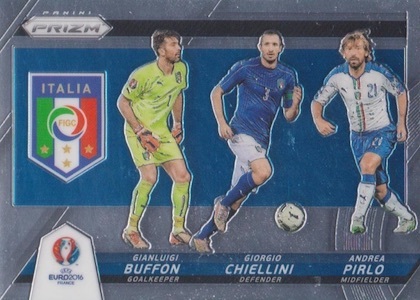 Bought a box hoping I’d get a half decent auto and I get a freaking Pirlo/Buffon Dual Auto 10/10 Gold Prizm AND a Chiellini Green Prizm #d to 5! INSANE pulls!